Today we got a big orenge enverope. Wao! It’s from our guest who live in Taiwan! 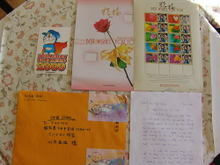 I opened it and found a letter, a post card and an another enverope with a picture of rose. I opened it and found the stamps. When this guest checked out he told me about the secret present…. This entry was posted in Pension Sakuraya on 2008年12月30日 by izusakuraya. I had some things to buy I went to Shimoda today. Before that I went to the small fisherman’s port in Shirahama. What a beautiful color this is! The ships were floating on the blue clear water. It’s really amazing. I show you one more photo which I took today ….. 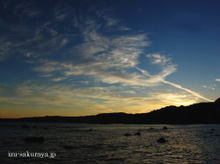 This entry was posted in beach, nature, Sea on 2008年12月28日 by izusakuraya. When I take beautiful photos I am very happy. Today I was going to the post office to post new year cards by bike in late afternoon. And as I found cloud in the sky I went to the north in Shirahama. I took this photo at Itado area. The sun was going into the west mountain. I show you one more photo …….. 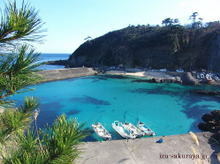 This entry was posted in nature, Sea on 2008年12月27日 by izusakuraya. In this season there are not so many people on the beach and it is very quiet. The water and sky are getting blue day after day. I love summer because we can swim, but I prefer this season to take photos. 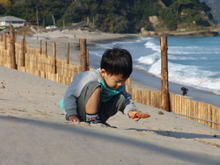 This entry was posted in beach on 2008年12月21日 by izusakuraya. Yuki and I went to the beach today. When we have many customers and we are very busy we can not play with my son, Yuuki. In this case he is playing alone in his room watching vedeo. 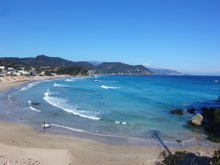 Today it was sunny and warm here in Shimoda. As we were not busy, I went to the beach with my son. This entry was posted in Family on 2008年12月11日 by izusakuraya. The flower is still blooming in Shimoda. In winter we have some kinds of flowers bloom in Shimoda. This is a narcissus which started to bloom. 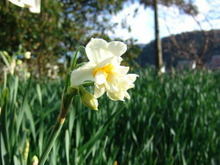 From December 20th "Narcissus festival" will take place in Shimoda to January 31st. Let’s get the early spring in Izu peninsula. This entry was posted in Flower on 2008年12月8日 by izusakuraya. I went to the aquarium in Shimoda after a long time. 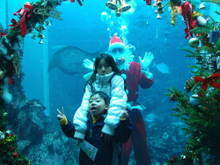 In this christmas season Santa Claus come to this aquarium like this photo. He has some shows with the sea animals, sea lion and dolphines. The purpose which we came today is ….. This entry was posted in Amusement Park on 2008年12月7日 by izusakuraya. After busy season we usually clean all rooms, kitchen, bathing rooms and dinning room. Yes, after busy season we are still busy…..
Today I moved the tables and chairs out and cleaned the floor. "Wao! this is my room to play, right?" And he started to play with his toy car. 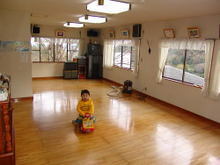 This entry was posted in Pension Sakuraya on 2008年12月1日 by izusakuraya.